Chapter Fifteen begins with a seemingly blissfully unaware Neville Landless–having set off on a journey–stopping at The Tilted Wagon tavern to refresh himself. Resuming his travels, he encounters four men. “Their manner was very curious.” They accost Neville. A reader’s first thought might turn to banditry, but they have come to take Neville into custody. He is later questioned in the presence of Crisparkle and Jasper. Here we learn that Neville and Drood left Jasper’s home at midnight and sojourned down to the river together and witness the Christmas Eve storm. Neville claims they were there for around ten minutes and then walked back to Neville’s lodgings at the Crisparkles, where the two men parted company. “Did he say he was going back down to the river again?” Neville is asked, but the response is negative. Jasper makes note of the blood upon Neville’s clothes and his walking stick. This is attributed to Neville’s skirmishing with the men who took him into custody, but a suspicion lingers. The matter is put before the mayor, Mr. Sapsea. A search of the river and embankments is made, but no trace of Drood surfaces. Jasper is much involved in the search. Soon after, Mr. Grewgious pays a visit to Jasper. Jasper asks after Rosa and, surprisingly, if Mr. Grewgious has seen the “suspected young man’s sister.” Grewgious confirms that he has, and than Miss Landless is defiant in the belief of her brother’s innocence. Then Grewgious tells Jasper of Rosa and Drood’s decision to dissolve their engagement. He “saw a ghastly figure rise, open-mouthed, from the easy chair, and lift its outstretched hands toward its head.” This figure, Jasper, then shrieks and crumples in a heap to the floor. In the following chapter, having recovered his senses, Jasper puts forth to Grewgious that there may be a glimmer of hope. That perhaps Drood “becoming sensitively alive to the awkward burden of explanation, in this quarter, and that, and the other, with which it would load him, he avoided the awkwardness, and took flight.” Jasper further explains his thoughts to Grewgious as if he’s trying to convince either himself or Grewgious of the fact. Further, Jasper admits that Neville and Drood were amicable at their last meeting, but that Drood seemed “depressed.” Crisparkle admits that Neville was “directly incensed against [Drood], by the circumstance of his romantically supposing himself to be enamoured of” Rosa Bud. Later Crisparkle’s pre-occupied mind and steps lead him to the Weir, further up from that part of the river where the search for Drood was conducted. Something glistening catches his eye and he discovers “by its chain, a gold watch, bearing engraved upon its back, E. D.” Swimming in that part of the Weir, Crisparkle searches further and finds only “a shirt-pin sticking in some mud and ooze.” These two items are recognized by Jasper as belonging to his nephew Drood. Two potentially important clues are raised prior to this conclusion. First, the jeweler identifies the watch he wound for Drood “had run down, before being cast into the water; and it was the jeweler’s positive opinion that it had never been re-wound.” Second, the watch and tie pin are assumed to have been thrown away. Ah, but what of Rosa’s ring that Drood was carrying? These two chapters together present an interesting insight into three characters: Neville, Crisparkle, and Jasper. We are able to view circumstances from their perspective and each of these moments appear, on the surface, to further each man’s innocence in the crime. Jasper’s is perhaps the least convincing of the three in that respect, but it leaves the door open for reasonable doubts. Crisparkle has no apparent moment, but his pre-occupied thoughts leading him to the Weir and finding the incriminating watch and tie pin are quite providential. 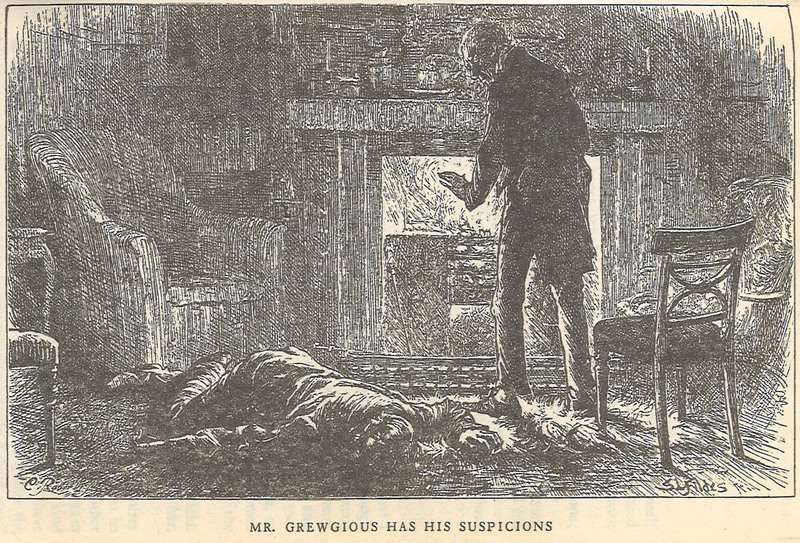 Neville’s actions on the morning after give no hint that he feared pursuit or was even aware of Drood’s disappearance. So what facts have we not yet learned, if any? Are there any other possible suspects besides Jasper and Neville? So far these two men are the only ones to have any apparent motive to kill Drood. And, as in any detective story, who shall be our sleuth? Stay tuned and stop by next week for Chapters Seventeen and Eighteen.